Sr Jacqueline Bilodeau (formerly Sr M. Charlene) died on July 28, 2009 at Elizabeth Seton Nursing Home in Wellesley, MA, after a long illness. She was born on August 4, 1930 in Providence, Rhode Island. She was the daughter of the late Joseph and Berthe Bilodeau. Her only sister Paulette who was a member of the Religious of Jesus and Mary also predeceased her. 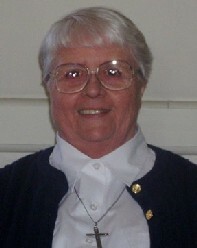 She leaves behind many cousins and her loving community of Marist Missionary Sisters. She also leaves behind the caring staff of Elizabeth Seton Nursing Home and Sisters of Charity who provided her with quality care during her last illness. Sister Jacqueline entered the Marist Missionary Sisters novitiate in Bedford, MA on July 31 st, 1950. She was professed on February 2nd 1953. After profession she studied nursing at St. John's hospital in Lowell, MA and received her RN in 1957. Upon graduation as a nurse she was missioned to a leprosarium in Jamaica, West Indies where she took her perpetual vows in 1959. In 1960 she received a new assignment to the Fiji Islands in the Pacific where she filled many leadership roles including local and regional superior. In 1976 she was assigned to a primitive mission hospital in the Chatham Islands where she was head nurse for two years after which she returned to Fiji for another two years. In 1984 she returned to the United States to give community service as coordinator and nurse for our sisters at 62 Newton Street. In 1991 she was named coordinator of our house in Lexington that provided services for our sisters who were in transition from one culture to another. From 1993 to 2000 she went on compassionate leave to take care of her aged mother in Rhode Island. After her mother's death she took up residence at our Vocation house in San Leandro, CA. In 2001 she was hospitalized with a mild stroke. She returned to 62 Newton Street for rehabilitation where she had a good recovery. Again she provided community service as receptionist and driver. In 2005 sister moved to a Rest Home at Marillac Residence in Wellesley Hills and received therapy for neuropathy. Her health continued to fail and in May 2007 she was admitted to Elizabeth Seton Nursing Home and diagnosed with lupus. Sister Jacqueline died peacefully on July 28,2009. The Marist Missionary Sisters from Marillac as well as the sisters from Grove Street, Belmont and Newton Street kept vigil with her around the clock during her last two days. Visiting hours were held at the Marist Missionary Sisters at 62 Newton Street on July 30th, 2009 from 2-4 pm and 6-8 pm. The Mass of Resurrection was held there on Friday at 10.00 am. Burial followed at St. Patrick's Cemetery in Watertown, MA. She will be remembered by all for her caring, loving and peaceful ways. May she rest in PEACE.